Okay everyone, get out your food journals, your pedometors, heart rate monitors, workout clothes, and your running shoes. The spree of “New Year Resolution” workout people has died down. They are burnt out and headed back to the couch to watch some TV. But for us…right here in this space, it’s time to get past the “I’m too busy” blues and get our butts in shape! As you already know, my blog is all over the place. I talk about writing, reading, crafts, everyday annoyances, and now fitness! Why? Because we need it in our lives. We need to be healthier and I think it’s even more important for writers to have a moment to step back and think about our health. We are usually sitting behind a computer for hours on end, grabbing quick snacks so we can hurry back to our writing, and probably crashing once the muse has decided to release us. I say we make a good effort in becoming the healthy writers we all want to be. Or just the healthy person you want to be (for the non-writers reading this.) So…who is with me??! Sorry, I will use any excuse to put anything related to The Breakfast Club in every aspect of my life. Starting today I am cutting down on sweets. After yesterday, this should be easy. I was so hopped up on sugar that I was jittery and couldn’t calm myself. I think I got a taste of what it feels like to be on speed. Also, my mom, brother, and I are starting a contest to see who can lose the most weight in a month. Of course, we are going to have some kind of reward and punishment system for this. And at the end of a month, we will start again. I figured, why not bring along my friends for the ride. I am not asking you to give me your weight, because honestly, I don’t want to give you mine. I just want to share what I have learned and what I am doing for my weight loss. I also wanted somewhere I could throw out an update once a week to keep myself honest. To start things off, while my family is starting tomorrow, I am starting today. This morning this is what I had for breakfast. 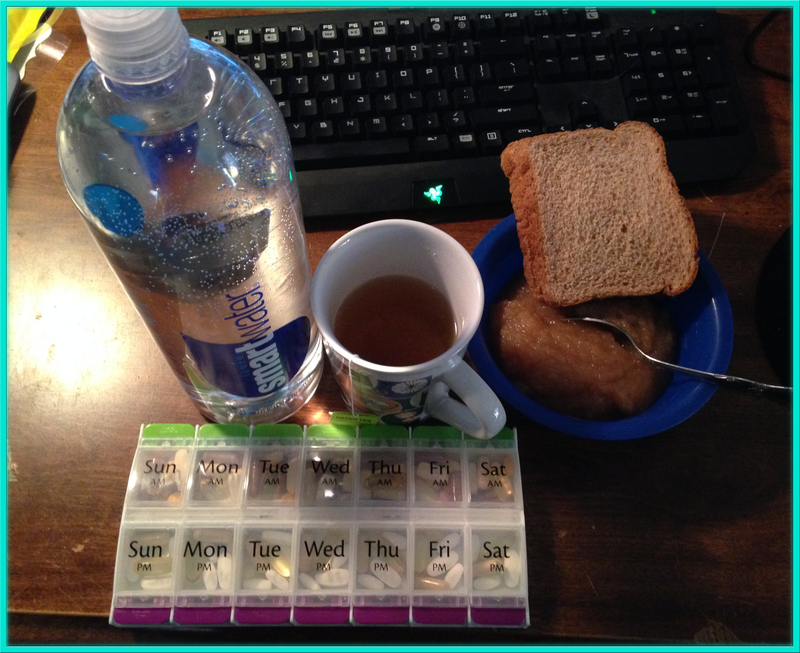 Water, peanut butter sandwich, applesauce, green tea with lemon, and my vitamins. First of all, how adorable is this cup!? I got it from Dollar Tree. I love the old typewriters on it, which is the main reason I got it. My green tea is by Bigelow. I don’t like the taste of regular green tea, but I love it with lemon in it. I usually drink Twinings hot tea, but this was the first brand that I found with lemon, so that is what I have at the moment. 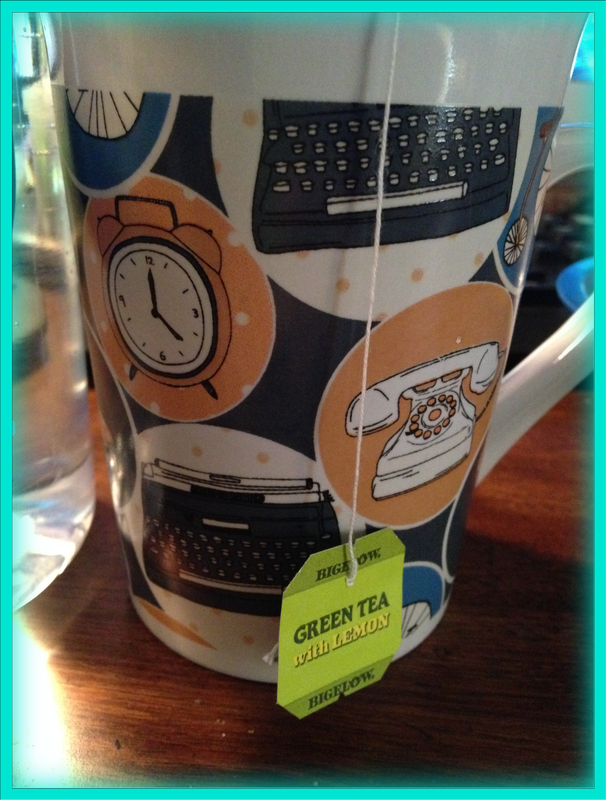 Once I finish what I have I will probably get Twinings green tea with lemon, because I love the brand. Fun fact, I started drinking hot tea and specifically the Twinings brand because one of my favorite characters in The Hollows series by Kim Harrison (second favorite author!) drinks the Earl Grey tea by Twinings. Actually, it’s the only reason I even tried Earl Grey tea, which opened the door for all amazing hot teas that I enjoy now. Even in the summer! Does this make me weird? Anyways. Green tea along has a ton of health benefits, so I will be drinking one a day every day…until I either run out or forget. I forget a lot. Add the lemon to the green tea and you have a powerhouse of health benefits, including ridding your body of toxins. Of course we all know to drink plenty of water. My water bottle is 1.5 liters and I will try to drink at least two a day. You are supposed to drink so much water based on your weight. I can’t remember the formula..I think it’s half your weight in ounces. So say you weight 180 pounds you would drink 90 ounces of water and I think that is just the base before you add in sweating and working out. I’m not a doctor, nor a scientist, this is just what I read and I can’t find the article. The food is simple and healthy. Wheat bread and peanutbutter with Omega-3 (it’s creamy and delicious) and the applesauce is 100% homemade by my mom, so I know everything that went into it. Vitamins. I realize this post is getting long but I promise, we are getting to an end. Here is a list of vitamins I am taking and what they are good for. One Daily- Multivitamin that everyone should be taking. B-2 – I take this because it helps with migraines. Seriously, I have not had a migraine since I started taking them. Cinnamon- Helps control blood sugar, increases circulation, and is rumored to help curve your appetite. Omega-3 – Helps lower blood sugar. It’s good for your heart. Calcium with Vitamin D3 – Lowers blood sugar as well as helps keep your bones strong. Magnesium – Helps muscle and nerve function, heart rhythm, blood pressure, immune function, and promotes healthy bones. Also, regulates blood sugar. Garlic – Lowers blood pressure and cholesterol. A lot of these vitamins have other benefits too, but this is the information I have in front of me right now. My mom is type 2 diabetic and my dad has high blood pressure. So, in the end it all makes sense. Come back next week for more fitness discussion. I will start saving links so I can share my sources as well. Let’s get healthy together! Good luck with your fitness challenge! Thanks!! I always love giving myself a new challenge.